Scoop back with a single layer chiffon skirt attached. 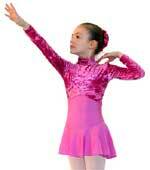 Tarifa leotard with attached skirt. 'see through' horizontal stripy nylon Lycra skirt. Nylon Lycra leotard with attached chiffon skirt. Lynia leotard with attached skirt. Camisole leotard with short flared skirt. Camisole leotard with short skirt. Attached skirt tapering up in the front. Sophia leotard with attached skirt. Decorated with a stretch braid of sparkling sequins. Flared short skirt tapering up at the front. Decorated around the keyhole, bustline and waistline with a 1 inch (2.5cm) wide stretchy braid of sparkling sequins. Tank top leotard with skirt attached. Square neckline at the back. 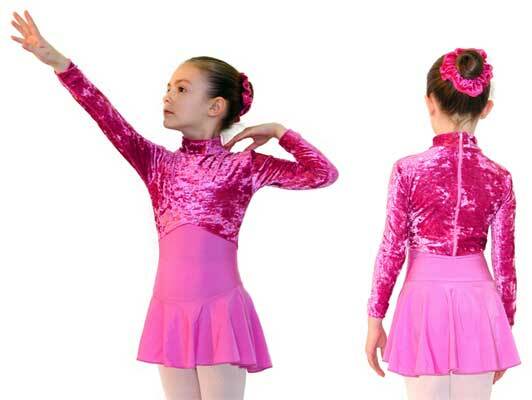 Ladies leotards with skirts are made to order in accordance with the size charts on this page.